We're graphic designers, but we're printers too. Not only do we design all of our invitation suites in house, but all of our letterpress and digital papers are printed right here in our Northern California production studio. Letterpress is and always will be our first love. It is the core of what we do here at Aerialist and what inspired our company almost 10 years ago! So what is letterpress? Simply, it is a form of relief printing where an inked, raised printing plate makes contact with paper using enough force to leave an impression in the paper, creating the luxurious, soft and pillowy look that elevates wedding stationery to drool-worthy status. Letterpress is not a quick and easy print style. It’s old school, which means you can’t push print on a computer and watch the magic happen. Inks are mixed by hand, individualized plates are made and a real person lines up the design, calibrates the press and oversees every step of printing. That’s why our letterpress turnaround time is a week longer than for digital printing. Because of the skill involved and artisanal nature of the style, letterpress is also the more expensive print option. WHAT IS FINE ART DIGITAL? Digital printing is a style almost everyone is familiar with. The invitation design is flat-printed directly on the surface of the paper and no specialized plates or inking are involved. So what makes our digital printing “fine art?” - in short, the caliber of the printers we use and the high quality of the paper we offer. When we digitally print our invitations, we only use high-end, professional machines specifically designed to produce archival quality prints. 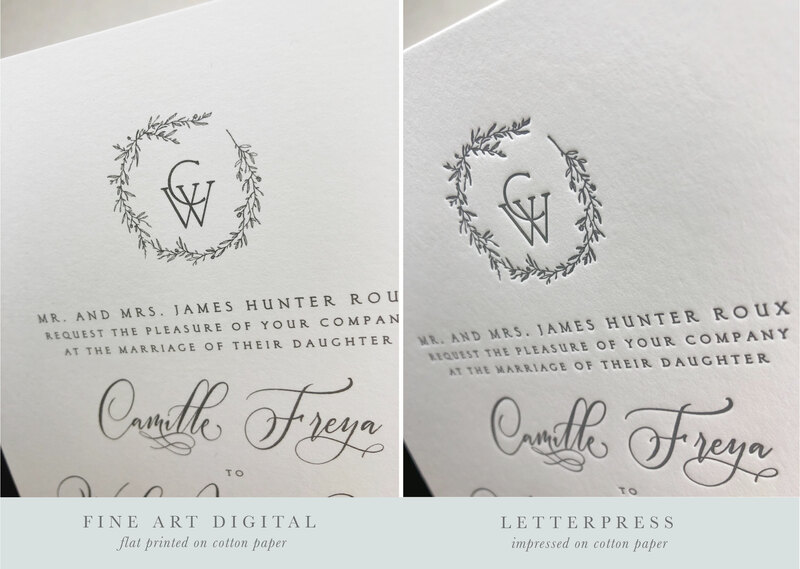 On the paper side, we use Strathmore Impress, which is 100% cotton (unheard of for digital invitations), thick, and has the textured feel of beautiful art paper. 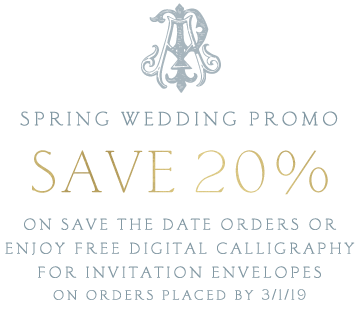 It closely mimics the Crane Lettra we offer for letterpress to give a similar heirloom feel to all of our invitations. Because digital printing doesn’t require specialized printing plates and hand calibration, our print turnaround time is a week faster and the overall cost is lower. Even though digital is generally considered a budget print method, with the quality of our printing and paper stocks, our digital cards feel luxurious and bespoke, like a fine art print. 1 IMPRESSION | Letterpress leaves a pillowy impression in the paper that you can feel when you run your fingertips over text and images, whereas digital is flat printed and doesn’t leave a discernible impression in the paper. 2 PAPER | To ensure the very best print quality, we only digitally print on papers optimized for that print style, so our digital and letterpress stocks are slightly different. Both paper stocks are made from cotton and have a luxe, textured feel, but they do differ slightly in color. 3 NUMBER OF COLORS | Letterpress is printed one color at a time, so there is an added cost for more than a single ink color. With digital, there is no limit to the number of ink colors we can print at a time so there is no added charge for including more than one color. 4 DOUBLE-SIDED | Digital cards can be printed double sided (ex: table numbers). Letterpress cards cannot because the impression from one side of the paper will interfere with the printing on the other side. 5 INK COLOR | Digital colors are slightly less vibrant and may vary slightly from letterpress inks. We offer samples of both so you can compare the difference. 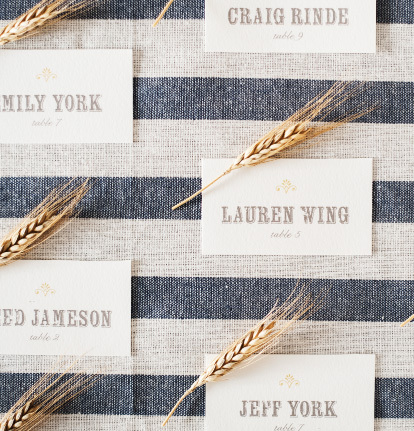 6 VARIABLE DATA | With digital, we can offer variable data printing, like place cards, where each guest’s individual name is printed on their card. This isn’t something we can do with letterpress because a new printing plate has to be made for each and every card we print.